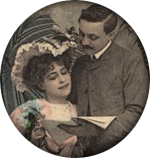 In December 2007 the Green Bay & De Pere Antiquarian Society, Inc. purchased a significant collection of historical and artistic objects for $1.3 million. 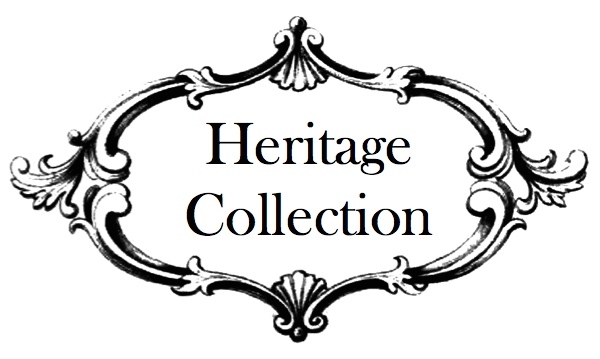 Funds were raised through a community-wide-and-beyond “Save our Cultural Heritage” campaign. Known as the "Heritage Collection", these nationally significant assets include the Matthew Brady Abraham Lincoln photograph signed by Lincoln, Presidential letters, Howard Pyle paintings, Middle Eastern oriental rugs, original artworks, and historic artifacts. Our partner, The Neville Public Museum, exhibited the entire collection in 2008. The collection remains in their care, while the Society retains ownership. Below are some highlights from this exciting collection! During Lincoln’s presidency, a man named Gustav Matile worked for John Hay, Lincoln's Assistant Private Secretary.. Matile had frequent contact with Lincoln and often obtained the President’s signature on letters, documents, and photographs. This photograph of Abraham Lincoln and his son Tad, was taken in 1864, at the studios of famous Civil War photographer, Mathew Brady. 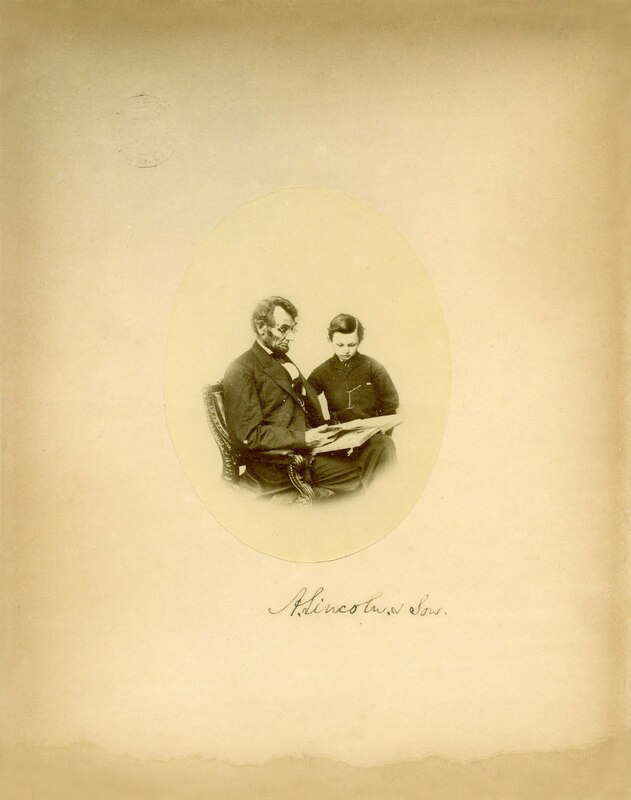 Signed "A Lincoln and son" by Abraham Lincoln, the photograph is one of only two in existence. After Lincoln’s assassination, Matile came to Green Bay. The photograph was gifted to the Kellogg Library at his death. The Antiquarians own letters signed by seven past Presidents: John Adams, John Q. Adams, Thomas Jefferson, James Madison, Andrew Jackson, Benjamin Harrison and Grover Cleveland. Used with generous permission of the Society. The Howard Pyle paintings became a part of the Kellogg Library’s collection through Alonzo Weston Kimball, a successful Green Bay business leader. Howard Pyle, a celebrated American artist of the early 20th century, is known as the "Father of American Illustration". His books and magazine illustrations were highly sought after in the late 19th century. 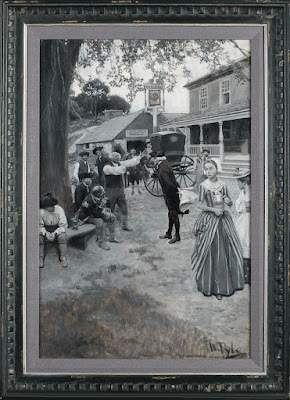 In 2012, the Society acquired and restored 22 spectacular paintings of Howard Pyle. 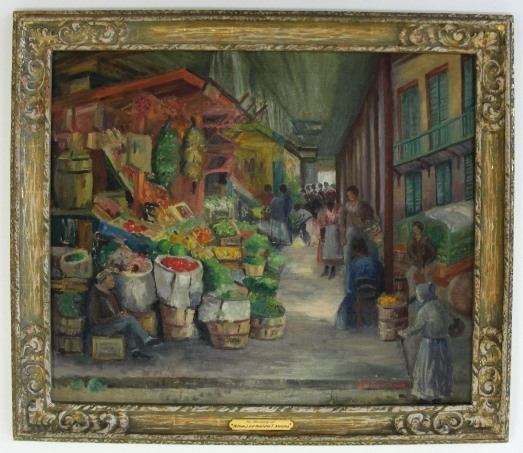 The collection reflects wide range of Pyle's subjects. These treasures have been on exhibit at the Hudson River Valley Museum in Yonkers, NY, the South Dakota Art Museum in Brookings, SD and at St. Norbert College in Green Bay, WI. A few of the paintings are slated to go to the Norman Rockwell Museum in Stockbridge, MA in 2018. Click here for a complete list and gallery of all Howard Pyle paintings in the collection. Click here to request information on displaying all or part of the collection at your institution. This painting is a version of an original painted by Cristofani Allori in 1615. Allori's original hangs in the Pitti Palace in Florence Italy. This incredible painting can be dated back to the early 1900’s, when it was purchased by Frederic G. Hall at an auction in New York. Hall hung it in downtown Green Bay's Beaumont Hotel; he gifted it to the Kellogg Library upon his death. The painting has also hung at the Wisconsin Historical Society and the Chicago Institute of Art. 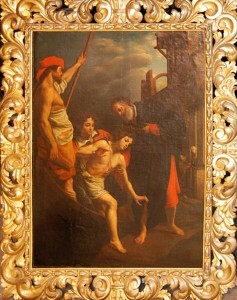 In 2011, Tony Rajer, art conservator, restored the painting. Note the beautiful Medici frame with gold-leaf gilding. The Hospitality of St. Julian is located at the Bishop Wysocki Center at Saint Francis Xavier Cathedral Church, 140 South Monroe Avenue, Green Bay, Wisconsin 54301. Saint Francis Xavier Cathedral Church: The Hospitality of Saint Julian: Unveiling ceremony held to welcome painting (Article from The Compass, December 22, 2011). Rufus Kellogg was one of the founders of Kellogg National Bank in 1874 (Now Associated Bank). He was a well-known business man and noted for his philanthropy. He is credited with being the driving force in the creation of the Kellogg Library where the Heritage Collection items were donated. This portrait of Kellogg was painted by Boston-born George P.A. 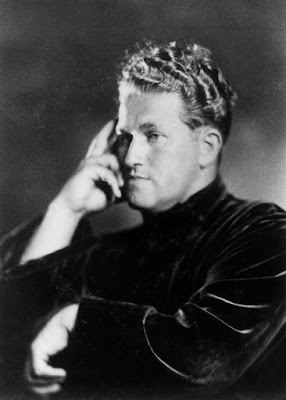 Healy, who was one of the most prolific and popular painters of his day. Among his portraits of eminent men are those of Daniel Webster, Henry Clay, John Calhoun, Pius IX (1871), Arnold Henry Guyot, William H. Seward, Louis Philippe, Marshal Soult, Hawthorne, Prescott, Longfellow, Liszt, Gambetta, Thiers, Lord Lyons, and the Princess (later the queen) of Rumania. He painted portraits of all the presidents of the United States from John Quincy Adams to Ulysses Grant—this series being painted for the Corcoran Gallery, Washington, D.C. Healy's 1877 portrait of a young Lincoln was the model used for a Lincoln postage stamp, issued on February 12, 1959, the 150th anniversary of Lincoln's birth. 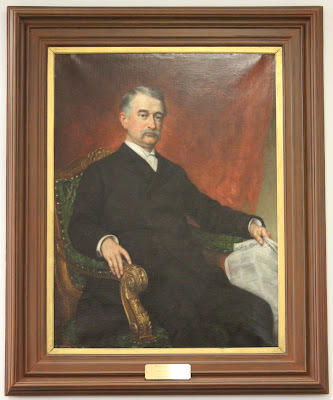 Healy's painting of Rufus B. Kellogg is on display in the lobby of Associated Bank, 200 North Adams Street, Green Bay. This painting by Edward Deming portrays Jean Nicolet’s first visit to the east shores of Green Bay. Deming painted many images of Native Americans and Wisconsin wildlife. In 1904, Robert Laird McCormick from Wisconsin Historical Society commissioned him to paint this particular depiction. The painting is signed, “to my friend Mr. Reuben G. Thwaites". Thwaites was a Wisconsin historian involved in collecting historical documents for the Wisconsin Historical Society. The painting is currently on display on the second floor of Nicolet Bank, 111 North Washington Street, Green Bay. 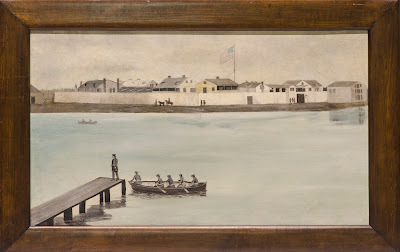 I employed an artist then in Green Bay to take a daguerreotype of Fort Howard in October of 1851 from the balcony of Thomas Green's hotel, the Washington House. He left his camera open too long on the first trial. On the second trial I was to pay the price for the picture whether good, bad or indifferent. The second trial was a most perfect success. The buildings and flags were perfect but above all the blue of the sky and white clouds were there, true to nature in color as well as form. While the artist was taking the scene I stood in the small board wharf running out into the river as if I had just landed while the boatman were in the act of shoving the boat away. This daguerreotype has been copied numerous times over the years. You will find a copy at Titletown Brewery, as well as at the Brown County Court House. A mural is located inside the Green Bay Correctional Institution. Green Bay historian Deborah Beaumont Martin featured the image in her book, "Old Green Bay." The Neville Public Museum has various copies and postcards from the original, and the scene is featured on the brass monument marking the site of the fort, which served as a military post under three countries, three names, and three flags: 1701 French Flag: Fort named "St. Francois"; 1761 British Flag: Fort renamed "Fort Edward Augustus"; 1816 American Flag: Fort renamed "Fort Howard". The painting is on permanent loan to Heritage Hill State Historical Park, and is displayed at the Fort Howard Guard House. 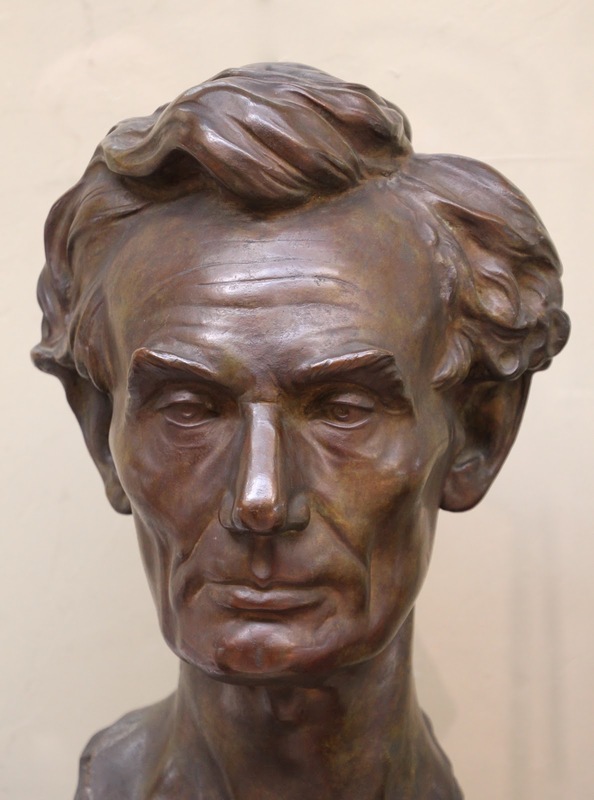 The Antiquarians own several Lincoln busts the most noted being a bronze cast done by Klabber & Company from New York done in 1860 of the newly elected president. Only six of these busts are known to exist. The other busts are at Westmoreland Museum of Art, Metropolitan Museum of Art, Dartmouth College’s Hood Museum of Art, Huntington Library and with a private collector. Klabber & Company went out of business in 1914. In addition to the Pyle collection, Alonzo Weston Kimball, a connoisseur of fine arts, gave the collection of textiles to the library. These one-of-a kind textiles were hand tied in the nineteenth century by Middle Eastern nomadic tribes. Included are very fine examples of weaving for Palaces and royalty families. This art form was a mainstay of the economies of ancient Persia, Caucasius, and Central Asia. The donor of these textiles intended to create a true collection, that is, a broad survey of examples of this specialized art form from a variety of nomadic tribes. The collection is housed at the Neville Public Museum, with some of them on display in their auditorium. Click here to view all rugs in the collection.